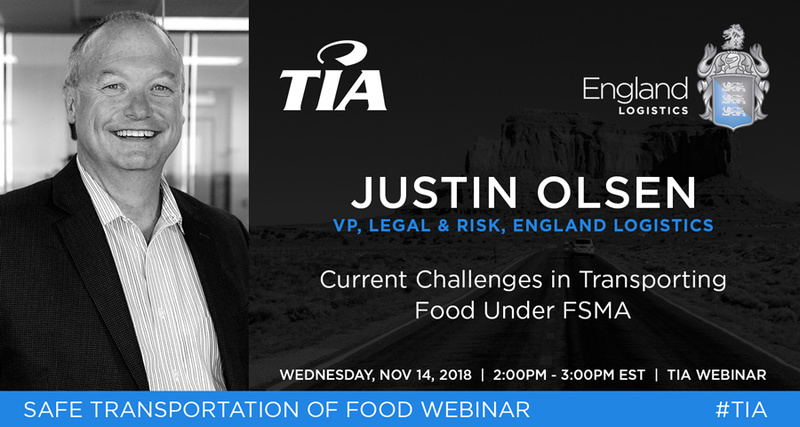 SALT LAKE CITY, Utah, November 12, 2018 – Justin Olsen, vice president of legal and risk management at England Logistics, will discuss the Sanitary Transportation of Food Final Rule during a TIA Delivers Education webinar. He will be joined by other brokerage-based logistics professionals. With the implementation of the Sanitary Transportation of Food Final Rule, Olsen will break down the rule’s requirements and discuss the legal implications. Stephanie Penninger, partner at Benesch, Friedlander, Copland & Aronoff LLP, and James Lee, vice president of legal affairs at Choptank Transport, Inc., will join Olsen for the webinar titled “I’m Kind of a Big Dill: Current Challenges in Transporting Food Under FSMA.” This webinar will take place on Wednesday, November 14 from 12:00 – 1:00 p.m. MST, and is exclusively available to TIA members. To register for this webinar, please visit www.tianet.org/TIA/Education. England Logistics offers a vast portfolio of non-asset based transportation solutions including full truckload services, intermodal, dry and cold chain LTL, parcel, global logistics, and complete supply chain management. England Logistics is an equal opportunity employer offering competitive national and international opportunities to qualified candidates. The company is recognized among the “50 Best Companies to Sell For” by Selling Power magazine and “Training Top 125” by Training magazine. Headquartered in Salt Lake City, Utah, the company also has offices in Atlanta, Georgia; Detroit, Michigan; Greeley, Colorado; and Portland, Oregon. To become part of England Logistics’ team call 866-476-7012 or visit http://www.englandlogistics.com.